Duncan Grove FRPS Photography Blog » Duncan captures from his office window Andy Murray practicing with his coach. Andy Murray & Jamie Dalgado practicing on the AELTC courts (shot from Duncan’s office window). 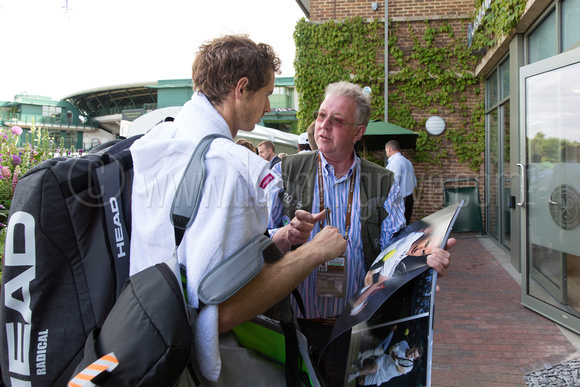 Andy Murray (left) kindly signing Duncan Grove’s (right) new Wimbledon Tennis photo book. Image courtesy of Heathcliff O’Malley Photography. 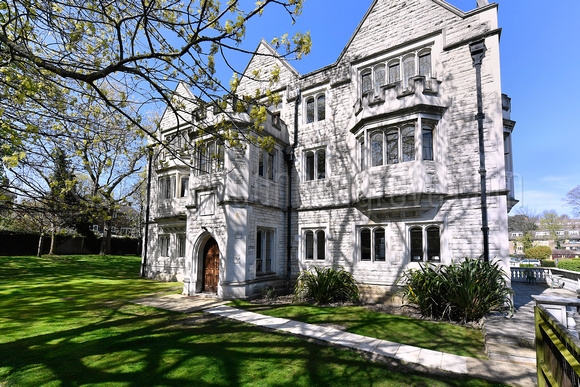 Duncan Grove Photography operates out of the ground floor of this converted gothic mansion, immediately adjacent to the AELTC and overlooking their Aorangi practice courts. 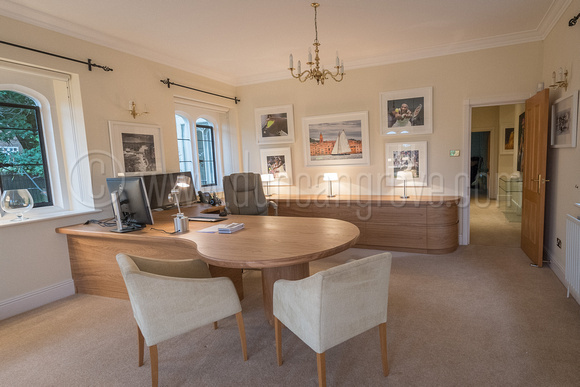 Duncan Grove Photography operates from impressive premises immediately adjacent to the AELTC and directly overlooking their Aorangi Practice Courts. Duncan often hears the gentle thwacking of tennis balls as Members practice. One morning whilst sat at his desk he suddenly hears several aggressive “THERWACK, THERWACKs“! Looking out of his window, Duncan saw Andy Murray practicing with his coach Jamie Dalgedo, just 25M away. He swiftly took a few shots, purposely including the window frames in order to prove the shooting location to his mates! He then went outside and started shooting over the fence. This was perfectly legitimate but as an accredited Wimbledon photographer there was obviously no way that Duncan would want to upset a Wimbledon Champion. Andy stopped playing and walked over. “Here we go” Duncan thought, “I am going to get grief.” In fact, this could not have been further from the truth. Andy just said “Hi, how are you?” and had a brief friendly chat. Duncan offered to stop shooting but Andy said that it was not a problem for him. Duncan comments:- “I have no relationship with Andy Murray but he probably recognises my face from seeing me around during so many Wimbledons. He has also very kindly on several occasions visited my exhibition (whilst on other business) and signed some of my large-format, fine-art exhibition prints as well as my photo book.